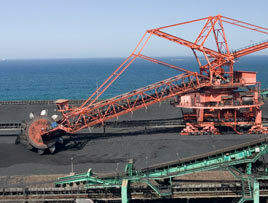 Port Kembla Coal Terminal (PKCT) is located approximately 1 hours drive south of Sydney. PKCT approached Katestone to assist it to use the data generated by the existing air quality monitoring network in a more proactive way for dust management. Working together with PKCT, Katestone developed a dust alert system that used historical data to fine-tune alert thresholds to ensure that reliable alerts are sent at the earliest possible time – a system that ‘cries wolf’ is not an effective system. The system frees onsite staff to focus on operations, confident that they will be informed of potential dust issues if they arise. The system can be applied to any bulk material handling operation that has the potential to generate nuisance dust. If you would like to see a similar system helping you to streamline your operation, we can certainly help you. Get in touch with our friendly team today.